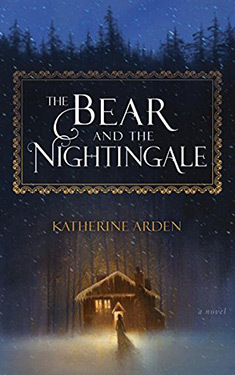 If you liked The Bear and The Nightingale you might like these books. At the edge of the Russian wilderness, winter lasts most of the year and the snowdrifts grow taller than houses. But Vasilisa doesn't mind--she spends the winter nights huddled around the embers of a fire with her beloved siblings, listening to her nurse's fairy tales. Above all, she loves the chilling story of Frost, the blue-eyed winter demon, who appears in the frigid night to claim unwary souls. Wise Russians fear him, her nurse says, and honor the spirits of house and yard and forest that protect their homes from evil. As danger circles, Vasilisa must defy even the people she loves and call on dangerous gifts she has long concealed--this, in order to protect her family from a threat that seems to have stepped from her nurse's most frightening tales. It was late winter in northern Rus', the air sullen with wet that was neither rain nor snow. The brilliant February landscape had given way to the dreary gray of March, and the household of Pyotr Vladimirovich were all sniffling from the damp and thin from six weeks' fasting on black bread and fermented cabbage. But no one was thinking of chilblains or runny noses, or even, wistfully, of porridge and roast meats, for Dunya was to tell a story. That evening, the old lady sat in the best place for talking: in the kitchen, on the wooden bench beside the oven. This oven was a massive affair built of fired clay, taller than a man and large enough that all four of Pyotr Vladimirovich's children could have fit easily inside. The flat top served as a sleeping platform; its innards cooked their food, heated their kitchen, and made steam-baths for the sick. "What tale will you have tonight?" Dunya inquired, enjoying the fire at her back. Pyotr's children sat before her, perched on stools. They all loved stories, even the second son, Sasha, who was a self-consciously devout child, and would have insisted--had anyone asked him--that he preferred to pass the evening in prayer. But the church was cold, the sleet outside unrelenting. Sasha had thrust his head out-of-doors, gotten a faceful of wet, and retired, vanquished, to a stool a little apart from the others, where he sat affecting an expression of pious indifference. The others set up a clamor on hearing Dunya's question: "Finist the Falcon!" "Ivan and the Gray Wolf!" "Firebird! Firebird!" Little Alyosha stood on his stool and waved his arms, the better to be heard over his bigger siblings, and Pyotr's boarhound raised its big, scarred head at the commotion. But before Dunya could answer, the outer door clattered open and there came a roar from the storm without. A woman appeared in the doorway, shaking the wet from her long hair. Her face glowed with the chill, but she was thinner than even her children; the fire cast shadows in the hollows of cheek and throat and temple. Her deep-set eyes threw back the firelight. She stooped and seized Alyosha in her arms. The child squealed in delight. "Mother!" he cried. "Matyushka!" Marina Ivanovna sank onto her stool, drawing it nearer the blaze. Alyosha, still clasped in her arms, wound both fists around her braid. She trembled, though it was not obvious under her heavy clothes. "Pray the wretched ewe delivers tonight," she said. "Otherwise I fear we shall never see your father again. Are you telling stories, Dunya?" "If we might have quiet," said the old lady tartly. She had been Marina's nurse, too, long ago. "I'll have a story," said Marina at once. Her tone was light, but her eyes were dark. Dunya gave her a sharp glance. The wind sobbed outside. "Tell the story of Frost, Dunyashka. Tell us of the frost-demon, the winter-king Karachun. He is abroad tonight, and angry at the thaw." Dunya hesitated. The elder children looked at each other. In Russian, Frost was called Morozko, the demon of winter. But long ago, the people called him Karachun, the death-god. Under that name, he was king of black midwinter who came for bad children and froze them in the night. It was an ill-omened word, and unlucky to speak it while he still held the land in his grip. Marina was holding her son very tightly. Alyosha squirmed and tugged his mother's braid. "Very well," said Dunya after a moment's hesitation. "I shall tell the story of Morozko, of his kindness and his cruelty." She put a slight emphasis on this name: the safe name that could not bring them ill luck. Marina smiled sardonically and untangled her son's hands. None of the others made any protest, though the story of Frost was an old tale, and they had all heard it many times before. In Dunya's rich, precise voice it could not fail to delight. "In a certain princedom--" began Dunya. She paused and fixed a quelling eye upon Alyosha, who was squealing like a bat and bouncing in his mother's arms. "Hush," said Marina, and handed him the end of her braid again to play with. "In a certain princedom," the old lady repeated, with dignity, "there lived a peasant who had a beautiful daughter." "Whasser name?" mumbled Alyosha. He was old enough to test the authenticity of fairy tales by seeking precise details from the tellers. "Her name was Marfa," said the old lady. "Little Marfa. And she was beautiful as sunshine in June, and brave and good-hearted besides. But Marfa had no mother; her own had died when she was an infant. Although her father had remarried, Marfa was still as motherless as any orphan could be. For while Marfa's stepmother was quite a handsome woman, they say, and she made delicious cakes, wove fine cloth, and brewed rich kvas, her heart was cold and cruel. She hated Marfa for the girl's beauty and goodness, favoring instead her own ugly, lazy daughter in all things. First the woman tried to make Marfa ugly in turn by giving her all the hardest work in the house, so that her hands would be twisted, her back bent, and her face lined. But Marfa was a strong girl, and perhaps possessed a bit of magic, for she did all her work un- complainingly and went on growing lovelier and lovelier as the years passed. "Marfa was in the izba cooking pancakes. She looked at her step- mother with astonished joy, for the lady had never taken an interest in her, except to find fault. But her delight quickly turned to dismay. "The husband--his name was Boris Borisovich--stared in horror at his wife. Boris loved his daughter, after all, and the cold embrace of the winter god is not for mortal maidens. But perhaps Darya had a bit of magic of her own, for her husband could refuse her nothing. Weeping, he loaded his daughter into the sledge, drove her deep into the forest, and left her at the foot of a fir tree. "Long the girl sat alone, and she shivered and shook and grew colder and colder. At length, she heard a great clattering and snapping. She looked up to behold Frost himself coming toward her, leaping among the trees and snapping his fingers." "But what did he look like?" Olga demanded. "The wind blew harder than ever, howling about them in great, tearing gusts. Over the din he asked, 'And now? Quite warm?' The girl shrieked back, 'But no, idiot! I am frozen! I have never been colder in my life! I am waiting for my bridegroom Frost, but the oaf hasn't come.' Hearing this, Frost's eyes grew hard as adamant; he laid his fingers on her throat, leaned forward, and whispered into the girl's ear, 'Warm now, my pigeon?' But the girl could not answer, for she had died when he touched her and lay frozen in the snow. "Then she saw the corpse of her child, huddled up in the bottom of the sledge. At that moment, the finger of Frost touched Darya's heart, too, and she fell dead on the spot." There was a small, appreciative silence. Then Olga spoke up plaintively. "But what happened to Marfa? Did she marry him? King Frost?" "Cold embrace, indeed," Kolya muttered to no one in particular, grinning. Dunya gave him an austere look, but did not deign to reply. "Well, no, Olya," she said to the girl. "I shouldn't think so. What use does Winter have for a mortal maiden? More likely she married a rich peasant, and brought him the largest dowry in all Rus'." Olga looked ready to protest this unromantic conclusion, but Dunya had already risen with a creaking of bones, eager to retire. The top of the oven was large as a great bed, and the old and the young and the sick slept upon it. Dunya made her bed there with Alyosha. The others kissed their mother and slipped away. At last Marina herself rose. Despite her winter clothes, Dunya saw anew how thin she had grown, and it smote the old lady's heart. It will soon be spring, she comforted herself. The woods will turn green and the beasts give rich milk. I will make her pie with eggs and curds and pheasant, and the sun will make her well again. But the look in Marina's eyes filled the old nurse with foreboding. The lamb came forth at last, draggled and spindly, black as a dead tree in the rain. The ewe began licking the little thing in a peremptory way, and before long the tiny creature stood, swaying on minute hooves. "Molodets," said Pyotr Vladimirovich to the ewe, and stood up himself. His aching back protested when he drew it straight. "But you could have chosen a better night." The wind outside ground its teeth. The sheep flapped her tail nonchalantly. Pyotr grinned and left them. A fine ram, born in the jaws of a late-winter storm. It was a good omen. Pyotr Vladimirovich was a great lord: a boyar, with rich lands and many men to do his bidding. It was only by choice that he passed his nights with his laboring stock. But always he was present when a new creature came to enrich his herds, and often he drew it to the light with his own bloody hands. The sleet had stopped and the night was clearing. A few valiant stars showed between the clouds when Pyotr came into the dooryard and pulled the barn door shut behind him. Despite the wet, his house was buried nearly to the eaves in a winter's worth of snow. Only the pitched roof and chimneys had escaped, and the space around the door, which the men of Pyotr's household laboriously kept clear. The summer half of the great house had wide windows and an open hearth. But that wing was shut when winter came, and it had a deserted look now, entombed in snow and sealed up in frost. The winter half of the house boasted huge ovens and small, high windows. A perpetual smoke trickled from its chimneys, and at the first hard freeze, Pyotr fit- ted its window-frames with slabs of ice, to block the cold but let in the light. Now firelight from his wife 's room threw a flickering bar of gold onto the snow. Pyotr thought of his wife and hurried on. Marina would be pleased about the lamb. The walks between the outbuildings were roofed and floored with logs, defense against rain and snow and mud. But the sleet had come with the dawn, and the slanting wet had soaked the wood and frozen solid. The footing was treacherous, and the damp drifts loomed head- high, pockmarked with sleet. But Pyotr's felt-and-fur boots were sure on the ice. He paused in the drowsing kitchen to ladle water over his slimy hands. Atop the oven, Alyosha turned over and whimpered in his sleep. His wife 's room was small--in deference to the frost--but it was bright, and by the standards of the north, luxurious. Swaths of woven fabric covered the wooden walls. The beautiful carpet--part of Marina's dowry--had come by long and circuitous roads from Tsargrad itself. Fantastic carving adorned the wooden stools, and blankets of wolf and rabbit skin lay scattered in downy heaps. The small stove in the corner threw off a fiery glow. Marina had not gone to bed; she sat near the fire, wrapped in a robe of white wool, combing her hair. Even after four children, her hair was still thick and dark and fell nearly to her knee. In the forgiving firelight, she looked very like the bride that Pyotr had brought to his house so long ago. "Is it done?" asked Marina. She laid her comb aside and began to plait her hair. Her eyes never left the oven. "Yes," said Pyotr, distractedly. He was stripping off his kaftan in the grateful warmth. "A handsome ram. And its mother is well, too-- a good omen." "Another one?" he asked. He straightened up and put his shirt aside. Marina heard the distress in his tone, and a sad smile touched her mouth. She bound the end of her hair with a leather cord before replying. "Yes," she said, flicking the plait over her shoulder. "A girl. She will be born in the autumn." His wife heard the silent question. "I wanted her," she said. "I want her still." And then, lower: "I want a daughter like my mother was." Pyotr frowned. Marina never spoke of her mother. Dunya, who had been with Marina in Moscow, referred to her only rarely. 0In the reign of Ivan I, or so said the stories, a ragged girl rode through the kremlin-gates, alone except for her tall gray horse. Despite filth and hunger and weariness, rumors dogged her footsteps. She had such grace, the people said, and eyes like the swan-maiden in a fairy tale. At length, the rumors reached the ear of the Grand Prince. "Bring her to me," Ivan said, thinly amused. "I have never seen a swan-maiden." Ivan Kalita was a hard prince, eaten with ambition, cold and clever and grasping. He would not have survived otherwise: Moscow killed her princes quickly. And yet, the boyars said afterward, when Ivan first saw this girl, he sat unmoving for a full ten minutes. Some of the more fanciful swore that his eyes were wet when he went to her and took her hand. Ivan was twice widowed by then, his eldest son older than his young lover, and yet a year later he married the mysterious girl. However, even the Grand Prince of Moscow could not silence the whispers. The princess would not say where she had come from: not then and not ever. The serving-women muttered that she could tame animals, dream the future, and summon rain. Pyotr collected his outer clothes and hung them near the oven. A practical man, he had always shrugged at rumors. But his wife sat so very still, looking into the fire. Only the flames moved, gilding her hand and throat. She made Pyotr uneasy. He paced the wooden floor. Rus' had been Christian ever since Vladimir baptized all of Kiev in the Dneiper and dragged the old gods through the streets. Still, the land was vast and changed slowly. Five hundred years after the monks came to Kiev, Rus' still teemed with unknown powers, and some of them had lain reflected in the strange princess's knowing eyes. The Church did not like it. At the bishops' insistence, Marina, her only child, was married off to a boyar in the howling wilderness, many days' travel from Moscow. Pyotr often blessed his good fortune. His wife was wise as she was beautiful; he loved her and she him. But Marina never talked about her mother. Pyotr never asked. Their daughter, Olga, was an ordinary girl, pretty and obliging. They had no need for another, certainly not an heir to the rumored powers of a strange grandmother. "You are sure you have the strength for it?" Pyotr said finally. "Even Alyosha was a surprise, and that was three years ago." "Yes," said Marina, turning to look at him. Her hand clenched slowly into a fist, but he did not see. "I will see her born." "Marina, what your mother was..."
His wife took his hand and stood. He wound an arm around her waist and felt her stiff under his touch. "I do not know," said Marina. "She had gifts that I have not; I re- member how in Moscow the noblewomen whispered. But power is a birthright to the women of her bloodline. Olga is your daughter more than mine, but this one"--Marina's free hand slipped up, shaping a cradle to hold a baby--"this one will be different." Pyotr drew his wife closer. She clung to him, suddenly fierce. Her heart beat against his breast. She was warm in his arms. He smelled the scent of her hair, washed clean in the bathhouse. It is late, Pyotr thought. Why borrow trouble? The work of women was to bear children. His wife had already given him four, but surely she would manage another. If the infant proved strange in some way--well, that bridge could be crossed when necessary. "Bear her in good health, then, Marina Ivanovna," he said. His wife smiled. Her back was to the fire, so he did not see her eyelashes wet. He tilted her chin up and kissed her. Her pulse beat in her throat. But she was so thin, fragile as a bird beneath her heavy robe. "Come to bed," he said. "There will be milk tomorrow; the ewe can spare a little. Dunya will bake it for you. You must think of the babe." Marina pressed her body to his. He picked her up as in the days of their courting and spun her around. She laughed and wound her arms around his neck. But her eyes looked an instant past him, staring into the fire as though she could read the future in the flames. "Get rid of it," said Dunya the next day. "I don't care if you're carrying a girl or a prince or a prophet of old." The sleet had crept back with the dawn and thundered again without. The two women huddled near the oven, for warmth and for its light on their mending. Dunya stabbed her needle home with particular vehemence. "The sooner the better. You've neither the weight nor the strength to carry a child, and if by a miracle you did, the bearing would kill you. You've given three sons to your husband, and you have your girl--what need of another?" Dunya had been Marina's nurse in Moscow, had followed her to her husband's house and nursed all of her four children in turn. She spoke as she pleased. Marina smiled with a hint of mockery. "Such talk, Dunyashka," she said. "What would Father Semyon say?" "Father Semyon is not likely to die in childbed, is he? Whereas you, Marushka..."
Marina looked down at her work and said nothing. But when she met her nurse 's narrowed eyes, her face was pale as water, so that Dunya fancied she could see the blood creeping down her throat. Dunya felt a chill. "Child, what have you seen?" "It doesn't matter," said Marina. "Get rid of it," said Dunya, almost pleading. "Dunya, I must have this one; she will be like my mother." "Your mother! The ragged maiden who rode alone out of the forest? Who faded to a dim shadow of herself because she could not bear to live her life behind Byzantine screens? Have you forgotten that gray crone she became? Stumbling veiled to church? Hiding in her rooms, eating until she was round and greasy with her eyes all blank? Your mother. Would you wish that on any child of yours?" Dunya's voice creaked like a calling raven, for she remembered, to her grief, the girl who had come to Ivan Kalita's halls, lost and frail and achingly beautiful, trailing miracles behind her. Ivan was besotted. The princess--well, perhaps she had found peace with him, at least for a little. But they housed her in the women's quarters, dressed her in heavy brocades, gave her icons and servants and rich meats. Little by little that fiery glow, the light to take one's breath, had faded. Dunya had mourned her passing long before they put her in the ground. Marina smiled bitterly and shook her head. "No. But remember be- fore? You used to tell me stories." "A lot of good magic or miracles did her," growled Dunya. "I have only a little of her gift," Marina went on, ignoring her old nurse. Dunya knew her lady well enough to hear the regret. "But my daughter will have more." "And that is reason enough to leave the other four motherless?" Marina looked at her lap. "I--no. Yes. If need be." Her voice was barely audible. "But I might live." She raised her head. "You will give me your word to care for them, will you not?" "Marushka, I am old. I can give my promise, but when I die..."
"They will be all right. They--they will have to be. Dunya, I cannot see the future, but I will live to see her born." Dunya crossed herself and said no more. The first screaming winds of November rattled the bare trees on the day Marina's pains came on her, and the child's first cry mingled with their howl. Marina laughed to see her daughter born. "Her name is Vasilisa," she said to Pyotr. "My Vasya." The wind dropped at dawn. In the silence, Marina breathed out once, gently, and died. The snow hurried down like tears the day a stone-faced Pyotr laid his wife in the earth. His infant daughter screamed all through the funeral: a demon wail like the absent wind. All that winter, the house echoed with the child's cries. More than once, Dunya and Olga despaired of her, for she was a scrawny, pallid infant, all eyes and flailing limbs. More than once Kolya threatened, half in earnest, to pitch her out of the house. But the winter passed and the child lived. She ceased screaming and throve on the milk of peasant women. The years slipped by like leaves. On a day much like the one that brought her into the world, on the steely cusp of winter, Marina's black-haired girl-child crept into the winter kitchen. She put her hands on the hearthstone and craned to see over the edge. Her eyes glistened. Dunya was scooping cakes from the ashes. The whole house smelled of honey. "Are the cakes ready, Dunyashka?" she said, poking her head into the oven. "Nearly," said Dunya, hauling the child back before she could set her hair on fire. "If you will sit quiet on your stool, Vasochka, and mend your blouse, then you will have one all to yourself." Vasya, thinking of cakes, went meekly to her stool. There was a heap of them already cooling on the table, brown on the outside and flecked with ash. A corner of one cake crumbled as the child watched. Its insides were midsummer-gold, and a little curl of steam rose up. Vasya swallowed. Her morning porridge seemed a year ago. Dunya shot her a warning look. Vasya pursed her lips virtuously and set to sewing. But the rip in her blouse was large, her hunger vast, and her patience negligible even under better circumstances. Her stitches grew larger and larger, like gaps in an old man's teeth. At last Vasya could stand it no more. She put the blouse aside and crept nearer that steaming plate, on the table just out of reach. Dunya had her back to it, stooping over the oven. Closer still the girl crept, stealthy as a kitten after grasshoppers. Then she pounced. Three cakes vanished into her linen sleeve. Dunya spun round, caught a glimpse of the child's face. "Vasya--" she began sternly, but Vasya, frightened and laughing all at once, was already over the threshold and out into the sullen day. The season was just turning, the drab fields full of shaved stubble and dusted with snow. Vasya, chewing her honeycake and contemplating hiding-places, ran across the dooryard, down among the peasants' huts, and thence through the palisade-gate. It was cold, but Vasya did not think of it. She had been born to cold. Vasilisa Petrovna was an ugly little girl: skinny as a reed-stem with long-fingered hands and enormous feet. Her eyes and mouth were too big for the rest of her. Olga called her frog, and thought nothing of it. But the child's eyes were the color of the forest during a summer thunderstorm, and her wide mouth was sweet. She could be sensible when she wished--and clever--so much so that her family looked at each other, bewildered, each time she abandoned sense and took yet another madcap idea into her head. A mound of disturbed earth showed raw against the patchy snow, just at the edge of the harvested rye-field. It had not been there the day before. Vasya went to investigate. She smelled the wind as she scampered and knew it would snow in the night. The clouds lay like wet wool above the trees. A small boy, nine years old and Pyotr Vladimirovich in miniature, stood at the bottom of a respectable hole, digging at the frosty earth. Vasya came to the edge and peered down. "What's that, Lyoshka?" she said, around a mouthful. Her brother leaned on his spade, squinting up at her. "What's it to you?" Alyosha quite liked Vasya, who was up for anything--nearly as good as a younger brother--but he was almost three years older and had to keep her in her place. "Don't know," said Vasya, chewing. "Cake?" She held out half of her last one with a little regret; it was the fattest and least ashy. "Give," said Alyosha, dropping his shovel and holding out a filthy hand. But Vasya put herself out of range. "Tell me what you're doing," she said. Alyosha glared, but Vasya narrowed her eyes and made to eat the cake. Her brother relented. "It's a fort to live in," he said. "For when the Tatars come. So I can hide in here and shoot them full of arrows." Vasya had never seen a Tatar, and she did not have a clear notion of what size fort would be required to protect oneself from one. Nonetheless she looked doubtfully at the hole. "It's not very big." Alyosha rolled his eyes. "That's why I'm digging, you rabbit," he said. "To make it bigger. Now will you give?" Vasya started to hold out the honeycake but then she hesitated. "I want to dig the hole and shoot the Tatars, too." "Well, you can't. You don't have a bow or a shovel." Vasya scowled. Alyosha had gotten his own knife and a bow for his seventh name-day, but a year's worth of pleading had borne no fruit as far as weapons for her were concerned. "It doesn't matter," she said. "I can dig with a stick, and Father will give me a bow later." "No, he won't." But Alyosha made no objection when Vasya handed over half the cake and went to find a stick. They worked for some minutes in companionable silence. But digging with a stick soon palls, even if one is jumping up every few moments to look about for the wicked Tatars. Vasya was beginning to wonder whether Alyosha might be persuaded to leave off fort-building and go climb trees, when suddenly a shadow loomed over them both: their sister, Olga, breathless and furious, roused from a place by the fire to uncover her truant siblings. She glared down at them. "Mud to the eyebrows, what will Dunya say? And Father--" Here Olga broke off to make a fortuitous lunge, seizing the clumsier Alyosha by the back of his jacket just as the children broke cover like a pair of frightened quail. Vasilisa was long-limbed for a girl, quick in her movements, and it was well worth a scolding to eat her last crumbs in peace. So she did not look back but ran like a hare over the empty field, dodging stumps with whoops of glee, until she was swallowed by the afternoon forest. Olga was left panting, holding on to Alyosha by his collar. "Why don't you ever catch her?" said Alyosha, with some resentment, as Olga towed him back to the house. "She's only six." "Because I am not Kaschei the Deathless," said Olga with some asperity. "And I have no horse to outrun the wind." They stepped into the kitchen. Olga deposited Alyosha beside the oven. "I couldn't catch Vasya," she said to Dunya. The old lady raised her eyes heavenward. Vasya was extremely hard to catch when she did not wish to be caught. Only Sasha could do it with any regularity. Dunya turned her wrath on a shrinking Alyosha. She stripped the child beside the oven, sponged him with a cloth that, thought Alyosha, must have been made of nettles, and dressed him in a clean shirt. "Such goings-on," muttered Dunya while she scrubbed. "I'll tell your father, you know, next time. He 'll have you carting and chopping and mucking for the rest of the winter. Such goings-on. Filth and digging holes--"
But she was interrupted in her tirade. Alyosha's two tall brothers came stamping into the winter kitchen, smelling of smoke and live- stock. Unlike Vasya, they did not resort to subterfuge; they made straight for the cakes, and each shoved one whole into his mouth. "A wind from the south," said Nikolai Petrovich--called Kolya--the eldest, to his sister, his voice indistinct from chewing. Olga had regained her wonted composure and sat knitting beside the oven. "It will snow in the night. A good job the beasts are in and the roof is finished." Kolya dropped his sopping winter boots near the fire and flung himself onto a stool, seizing another cake in passing. Olga and Dunya eyed the boots with identical expressions of disapproval. Frozen mud had spattered the clean hearth. Olga crossed herself. "If the weather is changing, then half the village will be ill tomorrow," she said. "I hope Father comes in before the snow." She frowned as she counted stitches. The second young man did not speak, but deposited his armload of firewood, swallowed his cake, and went to kneel before the icons in the corner opposite the door. Now he crossed himself, stood, and kissed the image of the Virgin. "Praying again, Sasha?" said Kolya with cheerful malice. "Pray the snow comes gently, and Father not catch cold." The young man shrugged slim shoulders. He had wide, grave eyes, thick-lashed as a girl's. "I do pray, Kolya," he said. "You might try it yourself." He padded to the oven and peeled off his damp stockings. The pungent stink of wet wool joined the general smell of mud and cabbage and animals. Sasha had spent his day with the horses. Olga wrinkled her nose. Kolya did not rise to the jab. He was examining one of his sopping winter boots, where the fur had separated at the stitching. He grunted with disgust and let it drop next to its fellow. Both boots began to steam. The oven towered over the four of them. Dunya had already put in the stew for dinner, and Alyosha watched the pot like a cat at a mouse-hole. "What goings-on, Dunya?" Sasha inquired. He had come into the kitchen in time to hear the tirade. "Vasya," said Olga succinctly, and told the story of the honeycakes and her sister's escape into the forest. As she talked, she knitted. The faintest of rueful smiles dimpled her mouth. She was still fat with summer's bounty, round-faced and lovely. Sasha laughed. "Well, Vasya will come back when she gets hungry," he said, and turned to more important matters. "Is that pike in the stew, Dunya?" "Tench," said Dunya shortly. "Oleg brought four at dawn. But that strange sister of yours is too small to linger in the woods." Sasha and Olga looked at each other, shrugged, and said nothing. Vasya had been disappearing into the forest ever since she could walk. She would come back in time for dinner, as always, bearing a handful of pine-nuts in apology, flushed and repentant, catlike on her booted feet. But in this case they were wrong. The brittle sun slipped across the sky, and the shadows of the trees stretched monstrously long. At last Pyotr Vladimirovich himself came into the house, bearing a hen-pheasant by its broken neck. Still Vasya had not come back. The forest was quiet on the cusp of winter, the snow thicker be- tween the trees. Vasilisa Petrovna, half-ashamed and half-pleased with her freedom, ate her last half honeycake stretched out on the cold limb of a tree, listening to the soft noises of the drowsing forest. "I know you sleep when the snow comes," she said aloud. "But couldn't you wake up? See, I have cakes." She held out the evidence, now little more than crumbs, and paused as though expecting a reply. But none came, beyond a soft, rattling wind that stirred all the trees together. So Vasya shrugged, dabbed up the crumbs of her honeycake, and ran about the wood awhile, looking for pine-nuts. The squirrels had eaten them all, though, and the forest was cold, even to a girl born to it. At last, Vasya brushed the ice and bark from her clothes and set her feet for home, finally feeling the pricking of conscience. The forest was thick with shade; the shortening days slid rapidly to night, and she hurried. She would get a thundering scold, but Dunya would have dinner waiting. On and on she went, and then paused, frowning. Left at the gray alder, round the wicked old elm, and then she would see her father's fields. She had walked that path a thousand times. But now there was no alder and no elm, only a cluster of black-needled spruces and a little snowy meadow. Vasya swung round, tried a new direction. No, here were slender beeches, standing white as maidens, naked with winter and trembling. Vasya was suddenly uneasy. She could not be lost; she was never lost. Might as well be lost in her own house as lost in the woods. A wind picked up that set all the trees to shaking, but now they were trees she did not know. Lost, Vasya thought. She was lost in the dusk on the cusp of winter and it was going to snow. She turned again, tried another direction. But in that wavering wood, there was not one tree she knew. The tears welled suddenly in her eyes. Lost, I am lost. She wanted Olya or Dunya; she wanted her father and Sasha. She wanted her soup and her blanket and even her mending. An oak-tree loomed in her way. The child stopped. This tree was not like the others. It was bigger and blacker and gnarled like a wicked old woman. The wind shook its great black branches. Vasya, beginning to shiver, crept toward it. She laid a hand on the bark. It was like any other tree, rough and cold even through the fur of her mitten. Vasya stepped around it, craning up at the branches. Then she looked down and nearly tripped. A man lay curled like a beast at the foot of this tree, fast asleep. She could not see his face; it was hidden between his arms. Through rents in his clothes, she glimpsed cold white skin. He did not stir at her approach. Well, he could not lie there sleeping, not with snow coming out of the south. He would die. And perhaps he knew where her father's house lay. Vasya reached out to shake him awake but thought better of it. Instead, she said, "Grandfather, wake up! There will be snow before moonrise. Wake up!" For long moments, the man did not stir. But just when Vasya was nerving herself to lay a hand on his shoulder, there came a snuffling grunt, and the man raised his face and blinked one eye at her. The child recoiled. One side of his face was fair, in a rough-hewn way. One eye was gray. But the other eye was missing, the socket sewn shut, and that side of his face a mass of bluish scars. The good eye blinked sulkily at the girl, and the man sat back on his haunches as though to see her better. He was a thin creature, ragged and filthy. Vasya could see his ribs through the rents in his shirt. But when he spoke, his voice was strong and deep. "Well," he said. "It is a long time since I have seen a Russian girl." Vasya did not understand. "Do you know where we are?" she said. "I am lost. My father is Pyotr Vladimirovich. If you can take me home, he will see you fed, and give you a place beside the oven. It is going to snow." The one-eyed man smiled suddenly. He had two dog-teeth, longer than the rest, that dented his lip when he smiled. He came to his feet, and Vasya saw that he was a tall man with big, crude bones. "Do I know where we are?" he said. "Well, of course, devochka, little maiden. I'll take you home. But you must come here and help me." Vasya, spoiled since she could remember, had no particular reason to be untrusting. Yet she did not stir. The gray eye narrowed. "What manner of girl-child comes here, all alone?" And then, softer, "Such eyes. Almost I remember... Well, come here." He made his voice coaxing. "Your father will be worried." He bent his gray eye upon her. Vasya, frowning, took a small step toward him. Then another. He put out a hand. Suddenly there came the crunch of hooves in the snow, and the snorting breaths of a horse. The one-eyed man recoiled. The child stumbled backward, away from his outstretched hand, and the man fell to the earth, cringing. A horse and rider stepped into the clearing. The horse was white and strong; when her rider slid to the ground, Vasya saw that he was slender and bold-boned, the skin drawn tight over cheek and throat. He wore a rich robe of heavy fur, and his eyes gleamed blue. "What is this?" he said. The ragged man cringed. "No concern of yours," he said. "She came to me--she is mine." The newcomer turned a clear, cold look on him. His voice filled the clearing. "Is she? Sleep, Medved, for it is winter." And even as the sleeper protested, he sank once more to his place between the oak-roots. The gray eye filmed over. The rider turned on Vasya. The child edged backward, poised on the edge of flight. "How came you here, devochka?" said this man. He spoke with swift authority. Tears of confusion spilled down Vasya's cheeks. The one-eyed man's avid face had frightened her, and this man's fierce urgency frightened her, too. But something in his glance silenced her weeping. She lifted her eyes to his face. "I am Vasilisa Petrovna," she said. "My father is lord of Lesnaya Zemlya." They looked at each other for a moment. And then Vasya's brief courage was gone; she spun and bolted. The stranger made no attempt to follow. But he did turn to his horse when the mare came up beside him. The two exchanged a long look. "He is getting stronger," said the man. The mare flicked an ear. Her rider did not speak again, but glanced once more in the direction the child had taken. Out from the shadow of the oak, Vasya was startled by how fast night had fallen. Beneath the tree, it had been indeterminate dusk, but now it was night, woolly night on the cusp of snow, the air all dour with it. The wood was full of torches and the desperate shouts of men. Vasya cared nothing for them; she recognized the trees again, and she wanted only Olga's arms, and Dunya's. A horse came galloping out of the night, whose rider bore no torch. The mare saw the child an instant before her rider did, and skidded to a halt, rearing. Vasya tumbled to one side, skinning her hand. She thrust a fist into her mouth to muffle her cry. The rider muttered imprecations in a voice she knew, and the next instant, she was caught up in her brother's arms. "Sashka," sobbed Vasya, burying her face against his neck. "I was lost. There was a man in the forest. Two men. And a white horse, and a black tree, and I was afraid." "What men?" demanded Sasha. "Where, child? Are you hurt?" He put her away from him and felt her over. "No," quavered Vasya. "No--I am only cold." Sasha said nothing; she could tell he was angry, though he was gentle when he put her on his mare. He swung up behind and wrapped her in a fold of his cloak. Vasya, safe, with her cheek against the well-tended leather of his sword-belt, slowly ceased her weeping. Ordinarily Sasha tolerated his small sister following him about, trying to lift his sword or pluck the string of his bow. He indulged her, even, giving her a stump of candle, or a handful of hazelnuts. But now fear had made him furious and he did not speak to her as they rode. He shouted left and right, and slowly word of Vasya's rescue passed among the men. If she had not been found before the snow came, she would have died in the night, and only been discovered when the spring came to loosen her shroud--if she was found at all. "Dura," growled Sasha at last, when he had done shouting, "little fool, what possessed you? Running from Olga, hiding in the woods? Did you think yourself a wood-sprite, or forget the season?" Vasya shook her head. She was shivering in hard spurts now. Her teeth clattered together. "I wanted to eat my cake," she said. "But I got lost. I couldn't find the elm-stump. I met a man at the oak-tree. Two men. And a horse. And then it was dark." Sasha frowned over her head. "Tell me of this oak-tree," he said. "An old one," said Vasya. "With roots about its knees. And one-eyed. The man, not the tree." She shivered harder than ever. "Well, do not think of it now," said Sasha, and urged on his tired horse. Olga and Dunya met him at the threshold. The good old lady had tears all over her face and Olga was white as a frost-maiden in a fairy tale. They had raked all the coals out of the oven, and they poured water on the hot stones to make steam. Vasya found herself unceremoniously stripped and shoved into the oven-mouth to warm. The scolding began as soon as she was out. "Stealing cakes," said Dunya. "Running away from your sister. How could you frighten us so, Vasochka?" She wept as she said it. Vasya, heavy-eyed and repentant, murmured, "I'm sorry, Dunya. She was rubbed with horrible mustard-seed, and beaten with quick, whisking birch-branches, to liven her blood. They wrapped her in wool, bandaged her skinned hand, and poured soup down her throat. "It was very wicked, Vasya," Olga said. She smoothed her sister's hair and cradled her on her lap. Vasya was already asleep. "Enough for tonight, Dunya," Olga added. "Tomorrow is soon enough for more talk." not think she 'll take a chill." "But any man might, who was called from his hearth to look for her," snapped Pyotr. "Or I might," said Kolya. "A man wants his dinner after a day of mending his father's roof, not a night's ride by torchlight. I'll belt her tomorrow." "And so?" retorted Sasha coolly. "She's been belted before. It is not the task of men to manage girl-children. It wants a woman. Dunya is old. Olya will marry soon, and then the old lady will be left alone to raise the child." Pyotr said nothing. Six years since he put his wife in the earth, and he had not thought of another, though there were many who would have heard his suit. But his daughter had frightened him. When Kolya had sought his bed, and he and Sasha sat together in the dark, watching the candle burn low before the icon, Pyotr said, "Would you see your mother forgotten?" "Vasya never knew her," rejoined Sasha. "But a woman of sense-- not a sister or a kindly old nurse--would do her good. She will soon be unmanageable, Father." "It is not Vasya's fault Mother died," added Sasha, lower. Pyotr said nothing, and Sasha rose, bowed to his father, and blew out the candle.